Got a spare £29.51 for a cheap PC? 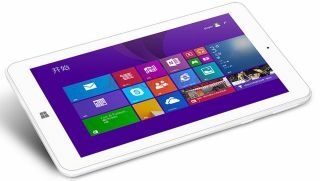 The race to the bottom in the world of Windows tablets continues as vendors scramble to get rid of existing stock ahead of the summer launch of Windows 10. The Chinese battleground is where things are the bloodiest as JD.com, one of China's largest e-commerce websites, has cut the price of its lowest-priced Windows tablet to 279 Yuan (about £29, $45, AU$58). For that price, you end up with something very similar to the Toshiba Encore Mini, called the Ployer MOMO7W. Like most entry level Windows tablets, it runs on an Intel quad-core Bay Trail clocked at 1.33GHz. There's a 7-inch 1024 x 600 pixels touchscreen display, 16GB onboard storage, 1GB of RAM, a micro SD card slot, a pair of cameras, a micro USB and micro HDMI port and a year subscription to Office 365 (with 1TB of OneDrive storage). It's worth underlining that Office 365 by itself costs about £50 in the UK, so Microsoft is essentially giving away a half-decent tablet with its business application. In theory, Windows 10 should be able to run on it, assuming that Microsoft manages to iron out some teething issues that I have encountered when I tried to install the company's latest OS on a similar machine. Check out the review of the Linx 7, a Windows 8.1 tablet with better specs.